We found 118 Results for "SC"
Good Sam Club Members SAVE 10% at over 2,400 Good Sam RV Parks and Campgrounds. 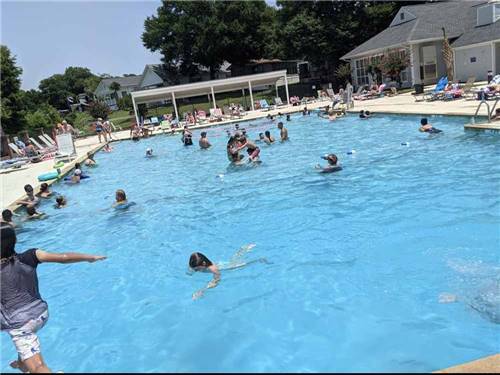 Guests appreciate the friendly staff and picturesque setting as well as convenient location to the many attractions in the Charleston area. For sightseeing or just relaxing, let us host your next camping experience. Explore Historic Downtown Charleston. Indulge in fine dining and shopping. 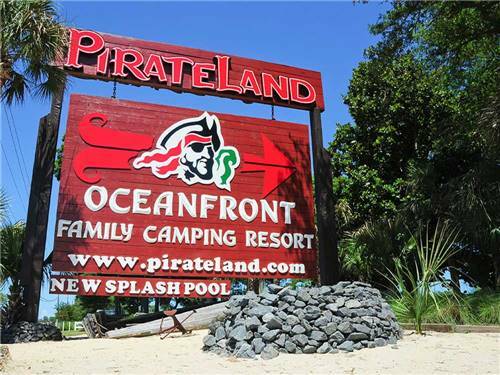 Experience the waterparks, walking trails, beaches, fishing and fun festivals. All minutes away. 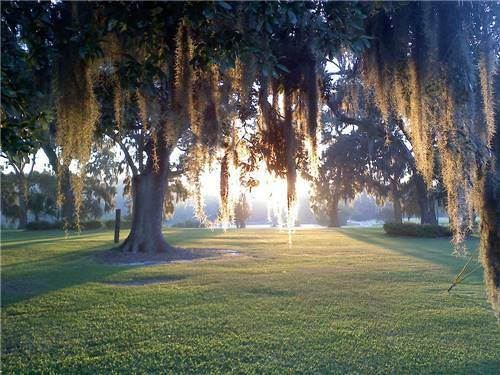 Charleston County Parks - Everything under the sun. 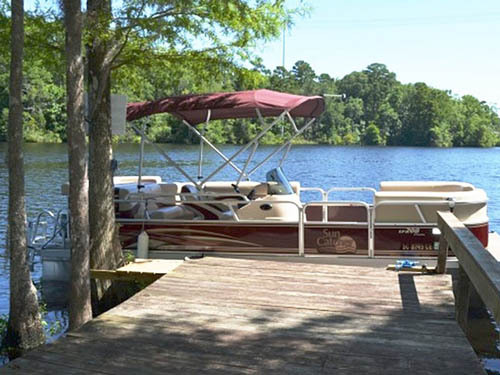 STAY ON THE INTRACOASTAL WATERWAY!! 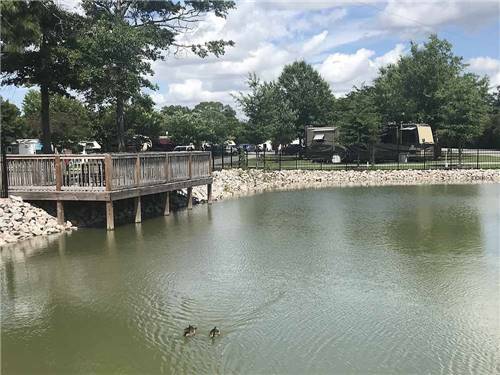 Beautiful Waterside Resort with landscaped sites & concrete pads. Enjoy excellent dining at the Sunset Grille. Charter a boat or jet-skis at our marina. Beautiful beaches & premier golf are minutes away. Ask about lot sales!! 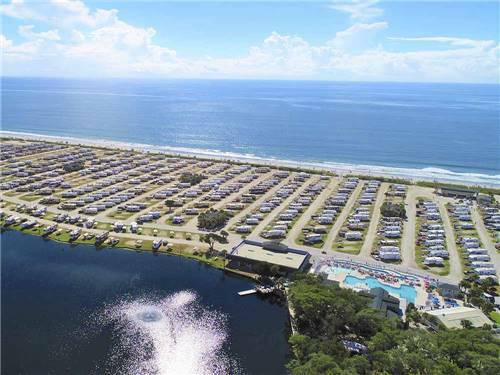 Our oceanfront camping resort features outstanding amenities, activities and customer service. Rent or camp: all pull-thru, concrete pads, inclusive rates - people, pets, full hook-ups, Wi-Fi. ARVC's 6 Time Park of the Year. at Myrtle Beach Travel Park! Choose from beach sites or shaded sites all with easy access to the beautiful Atlantic Ocean. We offer modern facilities and a variety of activities for ALL ages. 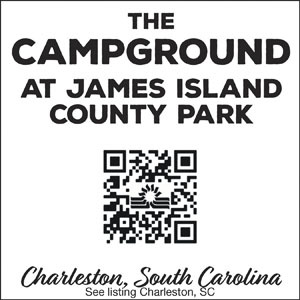 Selected as the Official Best Campground in South Carolina by Bestof.com. 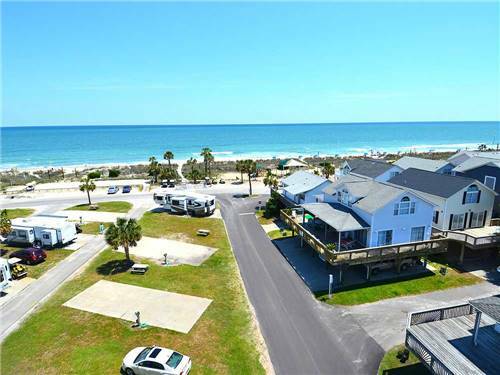 Spread over 200 oceanfront acres with 2000 campsites, 112 rental villas and many guest-pleasing amenities. Lakewood has it all! Discover a South Carolina Getaway where upscale energy meets down-home hospitality. 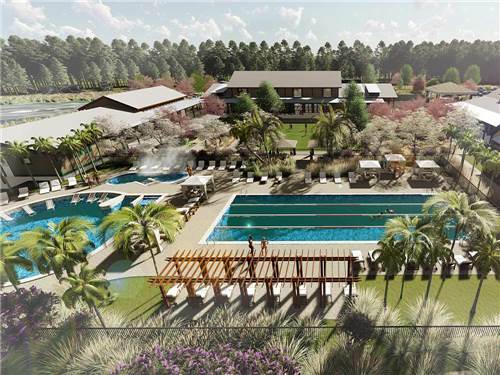 Come dive in, explore and discover a totally new kind of resort experience at Carolina Pines. A NIGHT, A WEEK, A MONTH, A SEASON! We provide a clean, safe and secure park, whether you're here for a night or several months. Clean bathrooms and showers are available. 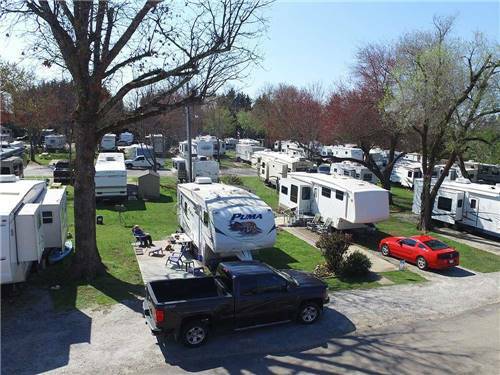 Integrity, honesty, dependability and persistence are Springwood RV Park's cornerstones. Welcome! Conveniently located minutes off of I-95 at Exit 8. 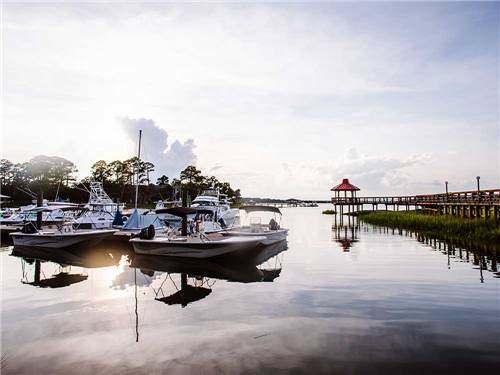 Our resort is convenient to Hilton Head Island and the historic cities of Beaufort and Savannah. Big Rig Friendly. 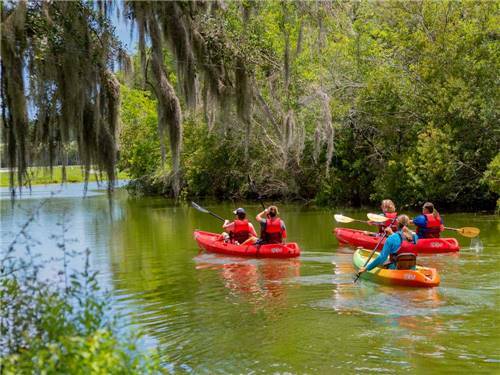 Hike, Paddle, Play, Tour, Relax! 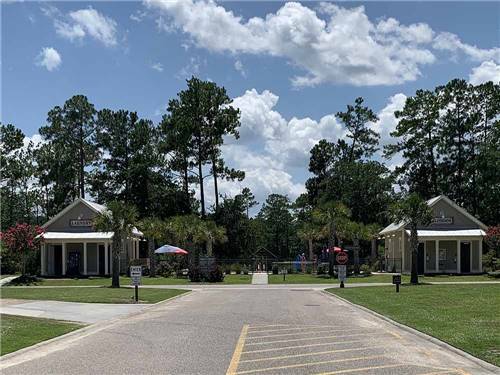 Enjoy a quality campground with a private fishing lake, beautiful pavilion and country setting that is only 12 miles to all the activities and sights of historic Charleston. Choose a full hookup site or secluded tent site. 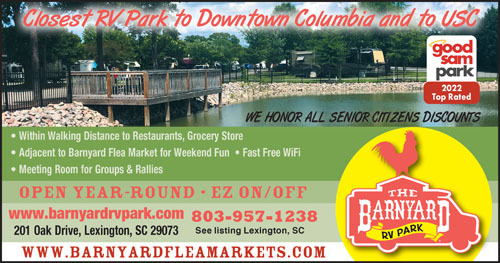 Located off Hwy 1, just minutes from I-20, I-26 and many area attractions. Come stay with us, kick back, relax and we will make you feel right at home. On weekends, experience Southern hospitality at our huge flea market. 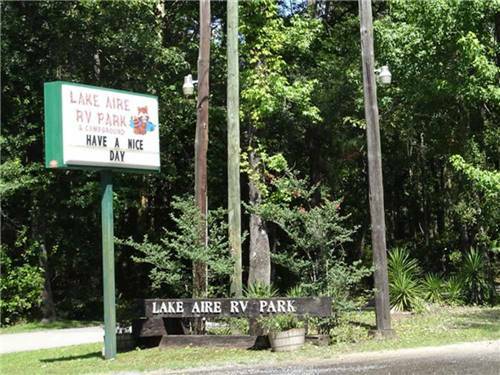 Cypress Camping Resort offers the Ultimate Formula! Vacation with Family & Boat--PERFECT! 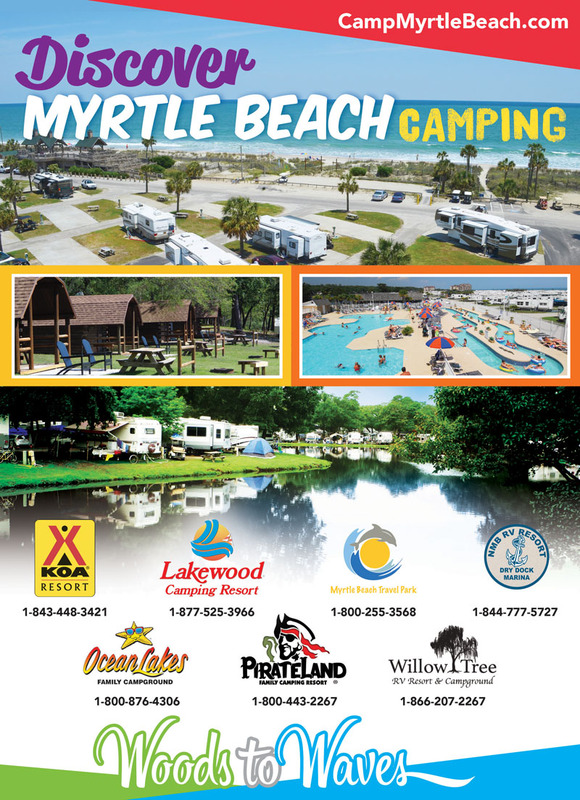 Awesome RV Sites, Cabins & Bunkhouses. Want More? 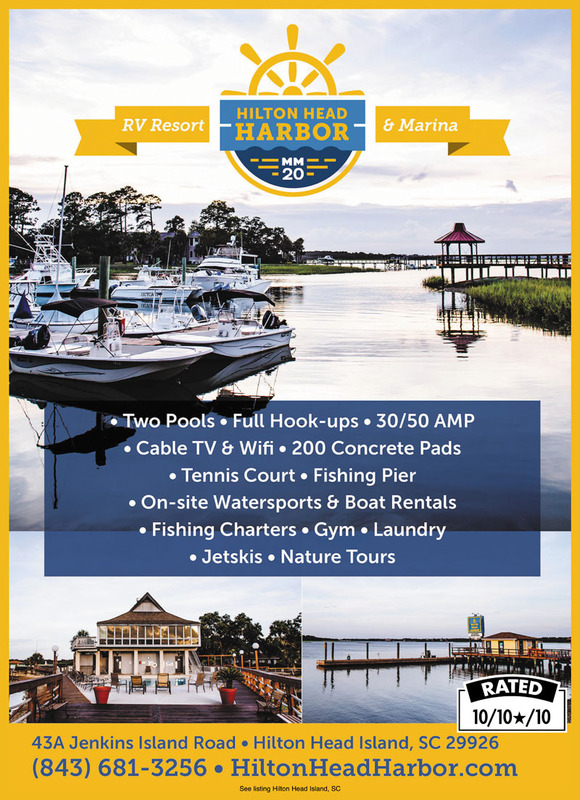 Pool, Docks, Ramp, Boat Rentals and, of course, FREE WIFI. You KNOW you have to come! 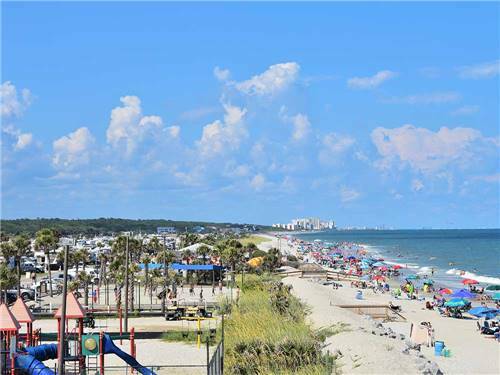 HEART OF MYRTLE BEACH-GRAND STRAND! As you arrive, you notice the Resort's excellent landscaping & beauty. Then you spot an 85' pool gazing at the Intracoastal, 18 holes of minigolf, pickle ball & playground. Sites? Amazing! A short drive to the beach. Make yourself at home! A one of a kind camping & tailgating experience. Located just minutes from Clemson University, I-85 and Historic Pendleton, you won't want to miss this! Enter the park as strangers, leave as family! 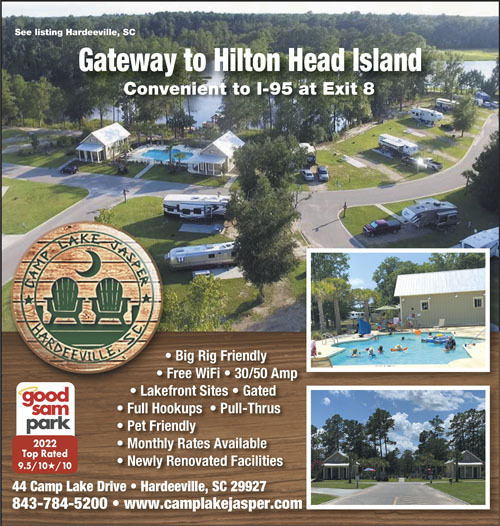 The three-number rating that accompanies each campground listing in the directory gives readers an at-a-glance assessment of a campground's amenities, cleanliness and environment. How to read the Good Sam Rating 10/10 /10. All three ratings categories are measured on a scale of 1 to 10, with 10 being the best.Less than 1 percent of parks or campgrounds receive the coveted 10 / 10 / 10 rating, which indicates superior facilities that are well maintained, clean, well-appointed restrooms and a highly appealing appearance.Campgrounds are inspected annually by dedicated RVers like you. 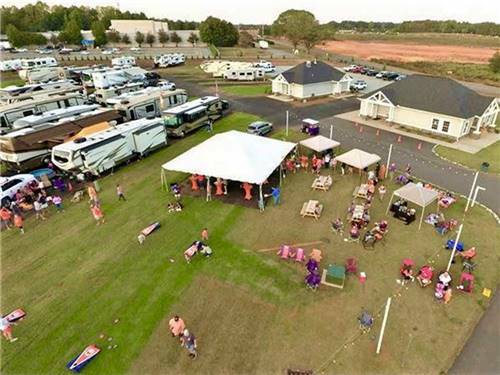 The first campground rating evaluates completeness and quality of facilities.In this category we rate interior roads, sites, registration area, hookups, recreation, swimming, security, laundry, store and building maintenance. The second rating category concerns the cleanliness and physical characteristics of toilets, walls, showers, sinks/counters/mirrors and floor. If a park achieves a full point in each of the above, it receives a star (), indicating exceptionally clean restrooms. Also rated are physical characteristics of restrooms, including interior construction, adequate supplies/odor free, adequate number of facilities, exterior appearance and location in relation to park spaces, and interior appearance. This category addresses the park's setting and site layout, function and identification of signage, overall exterior building maintenance, noise, trash disposal, litter and debris around the grounds and sites, and appearance of grounds, sites and entrance area.